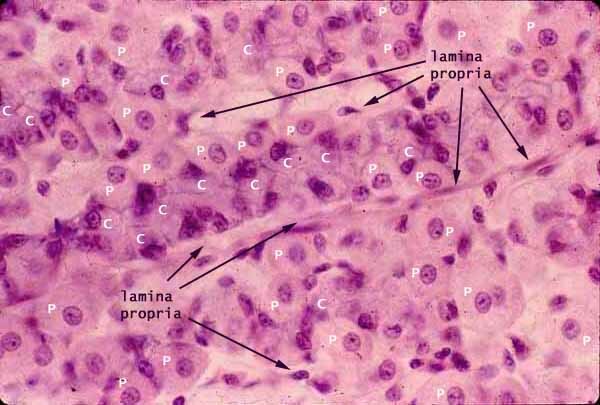 Most of the bulk of the gastric mucosa is occupied by secretory cells of the gastric glands, primarily parietal cells (P) and chief cells (C), together with lamina propria. In routine sections, these cells often appear rather jumbled together, especially in the midregion of the gastric glands. Although the secretory cells form tubular glands, the tubular shape is not usually apparent. Both because the glands are not quite straight and because the cells vary in size and shape, it is seldom possible to discern any clear organization. Nevertheless, there are usually noticable bands of large cells with more-or-less round nuclei. These are the secretory epithelial cells. Cells with conspicuous eosinophilic cytoplasm and centrally located nuclei (sometimes paired) are the parietal cells (P in cytoplasm of cells in the figure above). Cells with more basophilic cytoplasm and basal nuclei are the chief cells (C in cytoplasm of cells in the figure above). The bands of epithelial cells are separated by thinner strands containing denser, flattened or irregular nuclei. These nuclei belong to fibroblasts and endothelium of the lamina propria.